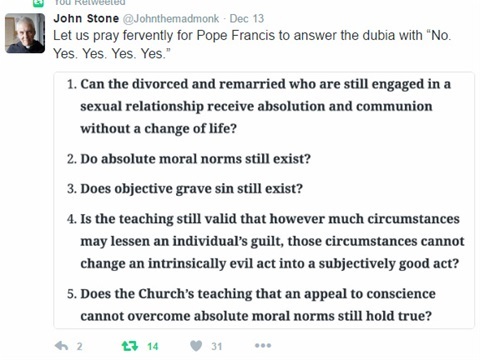 Possible Schism within the Catholic Church? To argue the point, have this page translated by your browser http://adelantelafe.com/escandalo-la-diocesis-del-papa-autoriza-la-comunion-los-adulteros/ and then read this http://www.vatican.va/roman_curia/congregations/cfaith/documents/rc_con_cfaith_doc_14091994_rec-holy-comm-by-divorced_en.html. I think this all needs clarification. To end, hopefully this article may provide some balance http://saltandlighttv.org/blogfeed/getpost.php?id=73120&language=en&radio=. On twitter @CardinalNapier remarks "This article makes good sense, & reflects accurately what was the view & feeling of many who participated in the Synod."